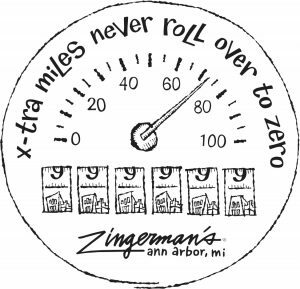 Going the extra mile at Zingerman’s means doing more than the guest has asked for—actually exceeding their expectations. Going the extra mile makes our customers leave their interactions with us thinking, “Wow! That was really nice.” And, we know from experience, it makes an enormous difference in the quality of the customer’s experience. Giving a taste of a new item to a regular customer. Sending an article to a client about their field of work. Calling a customer back a few days after they received their order to follow up on the effectiveness of the work we did for them. Adding a sample of something extra to an order. Sending a hand-written “thank you” note or email to a customer. Carrying a customer’s bag to their car. This is all simple stuff. Physically, it’s usually the easiest part of the process. But because we—not the customer— have to come up with what it means to go the extra mile for the guest, it’s often the most challenging part of the process, mentally. If the guest asks for something, simply filling their request does not qualify as an extra mile. Ultimately, I think these extra miles bring that little something extra to our service. It’s the stuff that sets us apart from our countless competitors and that keeps our customers coming back for more positive Zingerman’s Experiences. 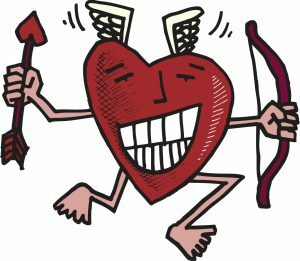 Secret 37 in Zingerman’s Guide to Good Leading, Part 3: A Lapsed Anarchist’s Approach to Managing Ourselves takes a look at how we perceive and use our time. We shared a tip from this essay a while back, and on this Valentine’s Day, we’re sharing the first of four principles discussed in the book about our relationship with time. If the main focus of all this timely activity is to develop a more positive relationship with time, then the first place to start, as with any relationship, is by devoting some quality time to it. Seriously, how many really rewarding relationships of any sort have you had that you didn’t devote meaningful time to? Getting to know time, quite simply, takes time; if your connection with your kids, your significant other, your work, or anything else you care about were merely something you squeezed into the spare moments that may crop up here and there, the quality of that relationship wouldn’t likely be very good. The same is true with time. Treat it like an unwanted stepchild, and the odds are that tension, frustration, and trouble are pretty sure to follow suit. The journaling I do every morning helps me get my mind around what I need to do for the day, how I’m feeling, what I’ve done, what I appreciate, what’s happened around me, and what I see coming up on the horizon. As I put down random thoughts and feelings, I’m pretty much always reminded of something I want to do, someone I want to appreciate, or something I can positively contribute that wasn’t in my mind when I began writing. When I start to worry about running out of time, I try to quiet my mind—I know that worrying is energy expended unproductively. Attempting to appreciate each moment and everything in it has helped me significantly—it’s turned my relationship with time into a positive, rewarding experience I like being part of, rather than an effort to escape from someone else’s idea of a rat race. An excerpt from Zingerman’s Guide to Good Leading, Part 1: A Lapsed Anarchist’s Approach to Building a Great Business, Secret #13. This is an internal mechanism that I’ve come to use regularly, and, in writing this piece, realized I should share more actively. When I’m having a really rough day (which of course happens) positive appreciation is the easiest way I know to turn things around. Appreciate, appreciate, appreciate… the old baseball saying “three and out” actually works pretty well and it’s kind of catchy. So I think I’m going to officially adopt it right now: When in doubt, three and out. The amazing thing is that by the time I’ve gone and appreciated at least three folks, it’s literally almost impossible for me to still be in a bad mood. And in the process of turning my own day around, I’ve contributed something small but upbeat to those with whom I’ve interacted. They in turn are more likely to do the same for others. And in the end, everyone—the organization, the staff, the customers, and the community—will all be better off for it. FTG is an acronym we use at Zingerman’s. It stands for First-Time Guests. I love that FTG has been well incorporated in our culture. 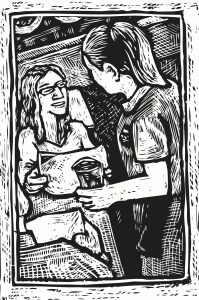 First-time guests—people who are new to Zingerman’s—have special needs. They need an orientation to what we do. They need nurturing. They need to have hope and belief that good things are possible as they try to navigate our often busy, confusing world. They need a touch more generosity of spirit early in the interaction, perhaps a taste of something wonderful well before they actually place their order. If we simply treat them as we would someone who’s been coming in regularly for years, the odds are low that they’ll have the great experience that we’re so committed to offering them. Understanding all that means we can welcome first-time guests even more enthusiastically than our already generally positive greetings. That we can encourage them to enter our world even though neither of us knows how the relationship is going to go. 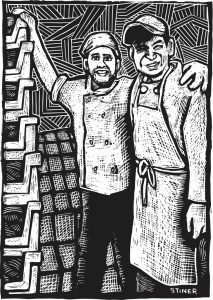 If we see them as seedlings being planted into the complex culture and community that is Zingerman’s, we know they need tending. When we do that work well, many of these new arrivals will grow into longtime loyal customers; some will even become integral pieces of our ecosystem. The same for new ideas. This is an insight that came to me while I was working on Part 3 of the series. I realized that if I wanted us to be an edgy, creative, and innovative organization, I needed to make sure that I was responding to new ideas appropriately. If I wasn’t upbeat and open to new ideas when they were coming my way, that closed-minded approach was likely to spread through our organization in an unhelpful way. In order to help myself respond positively, I decided I would treat new ideas like new customers. They often show up at inopportune times, like when I’m busy, behind, or in the middle of three other things. I know that some of them may never end up doing much business with us. I may not be immediately drawn to them. But if I ignore the idea, or dismiss it because I don’t have time to deal with it, it too will likely get trampled in the pall-mall madness that is the hectic, slightly crazy world of food service. So regardless of my initial emotional response, I try to still greet them with a welcoming attitude, in the belief that this is how good things come about. One of the most rewarding of these near-misses-turned-into-meaningful connection was with someone I met in passing at the University. Normally I’d have let our conversation lapse after a quick set of pleasantries. But with this new approach in mind, I decided to actively carry it further. Gina Athena Ulysse and I have struck up a mutually rewarding friendship in which we regularly share ideas and insights. Learning about her work in cultural anthropology, the history of her native Haiti, poetry, and performance art—on the surface, all unrelated to the food business—has led to a series of meaningful connections and helpful learnings. She introduced me to the thinking of Suzanne Césaire, the Martinique-born poet; to Suzanne’s husband, Aimé Césaire; and also his mentor, André Bloch, a French surrealist and, it turns out, anarchist. I’ve been especially energized, though, by Gina’s passion for changing the world’s beliefs about her homeland. Haiti has had a long and difficult history. In the process negative beliefs form, negative actions are taken, and . . . you know by now what the belief cycle is all about. Negative beliefs lead to negative outcomes. In her essay “Loving Haiti Beyond the Mystique,” Gina writes: “I grew up in a country that most of the world degrades and continues to dismiss because it is broken.” With that understanding and acceptance in hand, she set out to change the story. Her new book is then appropriately titled, Why Haiti Needs New Narratives. By shifting beliefs, she creates intriguing outcomes. “Imagine,” she writes, “what Haiti would be like had it been supported and nurtured instead of disavowed and shunned in its [national] infancy.” It’s a powerful reversal—a whole new narrative. It inspires me to learn more about Haiti. And closer to home, it reminds me to imagine what would happen if all the people we employ had been supported and nurtured by businesses when they began their work. Step 1. Figure out what the customer wants. Step 2. Get it for them: accurately, politely and enthusiastically. Step 3. Go the extra mile. Reflect regularly to keep a handle on how you’re doing responding more positively. A simple daily score sheet of positive versus negative responses can provide useful feedback in only a week.